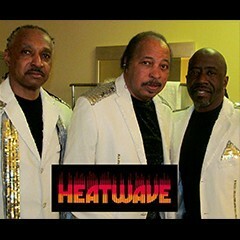 Heatwave is an international funk/disco band formed in 1975. Its most popular line-up featured Americans Johnnie Wilder Jr. and Keith Wilder (vocals) of Dayton, Ohio; Englishman Rod Temperton (keyboards); Swiss Mario Mantese (bass); Czechoslovak Ernest “Bilbo” Berger (drums); Jamaican Eric Johns (guitar); and Briton Roy Carter (guitar). They are known for their singles “Boogie Nights”, “The Groove Line”, and “Always and Forever”. Heatwave reconvened in a new line-up to record and release the album The Fire in 1988. However, Keith Wilder was the only original member of the band present in this incarnation (although Billy Jones, who had joined the band in the late 1970s returned as well). Meanwhile, that same year, Johnnie Wilder released a solo spiritual album My Goals on Light. The Wilder brothers once again teamed up the following year for the gospel album, Sound of Soul. Heatwave’s recognition was revitalised in 1991, when a remix version of their “Mind Blowing Decisions” charted in the UK. By the mid to late 1980s, Keith Wilder was joined by bassist Dave Williamson and vocalist Donovan Blackwood and in the 1990s had again reformed the band. Joined by keyboardists Kevin Sutherland and Byron Byrd, guitarist Bill Jones, and original drummer Ernest Berger, the reborn Heatwave launched an American tour with a live album recorded at the Greek Theater in Hollywood, arriving in 1997.